Sometimes, even the most luxurious , exclusive wristwatches all seem to have the same kind of look over them. When I discovered the Girard-Perregaux Vintage 1945 Tourbillon with Three Golden Bridges, I realized that I’d come across an extraordinary design that doesn’t have even a hint of generic style. No wonder there are only 50 made of this exclusive timepiece. Made to stand out and to inspire conversation and admiration, this dazzling and exclusive timepiece’s case and triple bridges are crafted of rosy pink gold that echoes the beauty of a particularly stunning sunrise. The bridges (that seem to be “floating”) are without a doubt the most eye catching feature on this watch (and loads of others too). 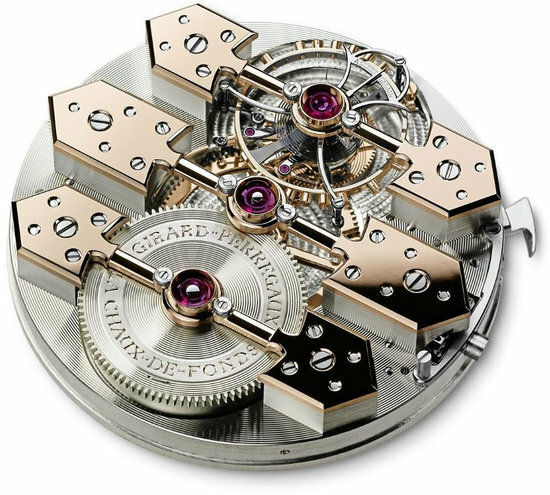 According to officials at Girard Perregaux crafting the bridges alone takes seven days of manual labor. And bear in mind this are only three of 72 components that complete the marvelous watch. The pink rose tone of the watch is the first clue that this design is really something special. However, its rare and unusual color is only the beginning of what it has to offer. Coated in anthracite for a smooth, low-shine finish, this watch has all of the restrained elegance of platinum, even though it’s made of precious gold. Contrasting accents, such as the main watch plate, add even more richness and dimension to the piece. This innovative anthracite finish is added through a delicate process that may only be performed by the best craftspeople, so it’s just one more example of how much effort, love and care goes into creating every single one of these limited-edition wristwatches. Designed to evoke the beauty of the best Art Deco sculpture and architecture, this beautiful wristwatch is ornate enough to please even the most discerning Art Deco aficionado. Of course, its vintage style doesn’t mean that it’s not a high-performance timepiece with all of the bells and whistles. This watch does it all, and its exquisite craftsmanship is definitely second to none. The watch’s three rose-golden bridges set it apart from the rest of the pack, and these polished marvels add incredible style and uniqueness to the Girard-Perregaux Vintage 1945 Tourbillon timepiece. The geometric bridges glimmer under a sapphire crystal cover, where their open-work design (each bridge is hand-guilloched) may be easily admired. Each bridge takes a week to make, so these design elements do make this particular timepiece incredibly special. Only fifty of these special watches were created, so there is also an element of exclusivity here that you may not find in other high-end wristwatches. If you want something that almost no one else has (and this is something that personally really appeals to me), you’ll love knowing that only a handful of these exciting, vintage-inspired pieces were ever created and found there way all over the world. In a nutshell, this watch is very different from other watches, and it will always fascinate. Its curved, rectangular case conforms to the contours of the wrist, offering a perfect fit that makes the watch a pleasure to wear. A shiny strap in black alligator leather completes the striking effect, by offering a touch of dark color that highlights the paler beauty of the rose gold case and bridges. Each watch is equipped with a tourbillon system that contains over seventy components. In addition, this wristwatch features a self-winding caliber GP600 movement with a built-in micro-rotor beneath the barrel. This special movement is patented by the company, and owners of these Art Deco-inspired timepieces may observe the movements’ workings through a transparent back cover, which is also crafted from sapphire crystal.